Hi there! If you've come here form tumblr, feel free to add me! :) Possibly send me a PM here or on tumblr and tell me who you are if your handle is different here than it is over there. Also feel free to ask me any questions about DW - I've been around here for some years, and even longer on LJ, the software of which DW is based on. 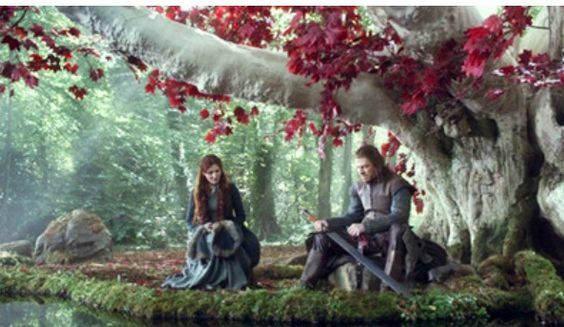 Catelyn found her husband beneath the weirwood, seated on a moss-covered stone. The greatsword Ice was across his lap, and he was cleaning the blade in those waters black as night. A thousand years of humus lay thick upon the godswood floor, swallowing the sound of her feet, but the red eyes of the weirwood seemed to follow her as she came. “Ned,” she called softly. Game of Thrones, Chapter 2 (Catelyn), pages 23-24.